Benign childhood focal seizures affect school going children with non-febrile seizures. There are three main electroclinical syndromes, which are recognized by the International League Against Epilepsy. They are (a) Rolandic epilepsy or benign epilepsy with centrotemporal spikes (BECTS) a common syndrome, (b) Panayiotopoulos syndrome (PS), autonomic epilepsy and (c) Idiopathic childhood occipital epilepsy of Gastaut (ICOE-G) including the idiopathic photosensitive occipital lobe epilepsy, which are not that common. These children are mostly neurologically normal with normal imaging of the brain. When a normal child presents with specific seizures and characteristic epileptiform features in the electroencephalography (EEG), then a diagnosis of benign seizures is suspected. Although benign occipital seizures are not as commonly encountered as BECTS, there is a need to recognize them early for appropriate management and better outcomes. We describe three children who presented with visual and non-visual symptoms and the EEG in all the three cases showed occipital paroxysms. One child is still having seizures, which are not so well controlled with medication, but the other two children have responded well to treatment. A 13-year-old boy presented with a history of seizures since the age of 5 years. Seizures initially started as brief episodes of blurring of vision. Corrective glasses for refractory error did not stop the episodes. Single seizure involving the left side prompted commencement of treatment with valproate syrup [Table 1], which made him seizure free for 2 years, but recurred. At the time, seizures were characterized by fear and cry, saying "save me" followed immediately by few seconds of blindness and then automatism of the hands. The boy would be responsive during the brief episodes, but less responsive during prolonged episodes with automatism. There is no available documentation of loss of vision post-event. Although there is no cry now, semiology is similar for brief episodes. Prolonged episodes have additional clenching of both fists with tonic posturing of arms more than legs. Sometimes, there is forced head turn mainly to the left accompanied by continuous eyelid fluttering and this could evolve into secondary generalized seizures. The duration lasts from 1-3 min. With secondary generalization, postictal confusion lasts for 20-30 min without any blindness. Seizures have gradually increased in frequency over the years from once every month to once every week and now to everyday seizures occurring in clusters leading to postictal drowsiness. The hallmark feature is the blurring of vision during these seizures. Throughout this course, his general behavior has been normal, but school performance was below average [Table 2]. As the boy continued to have daily seizures, parents withdrew him from school. He was initially treated with sodium valproate (VAP) alone then levetiracetam was added followed by lamotrigine (LTG) after withdrawing VAP. He was also treated with oxcarbazepine during the initial periods, but stopped due to unknown reason [Table 1]. 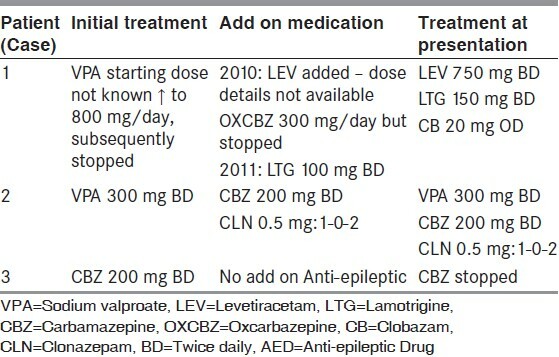 In 2012, when he presented to us with history of daily seizures, he was on levetiracetam, LTG and clobazam [Table 1]. Carbamazepine 200 mg BD was added as part of the polytherapy. Now his seizures are less frequent, 1-2/week without secondary generalization, but not fully controlled. Patient was diagnosed as occipital seizures in 2009. Imaging studies have not shown evidence for any focal lesions including positron emission tomography (PET) computed tomography (CT) [Table 3]. The boy is more interactive with better seizure control and is willing to start school again. A 14-year-old boy presented with history of seizures involving all four limbs since the age of 7 years. The current clinical seizures are characterized by initial grunting and face turning to the right followed by jerking of all four limbs lasting for a few minutes. The boy remains in a confused state for at least 30 min after seizures. He was treated with VAP 300 mg BD, carbamazepine (CBZ) 200 mg BD and clonazepam (CLN) 0.5 mg: 1-0-2 at the time of presentation [Table 1]. The working diagnosis at this time was primary generalized seizures. 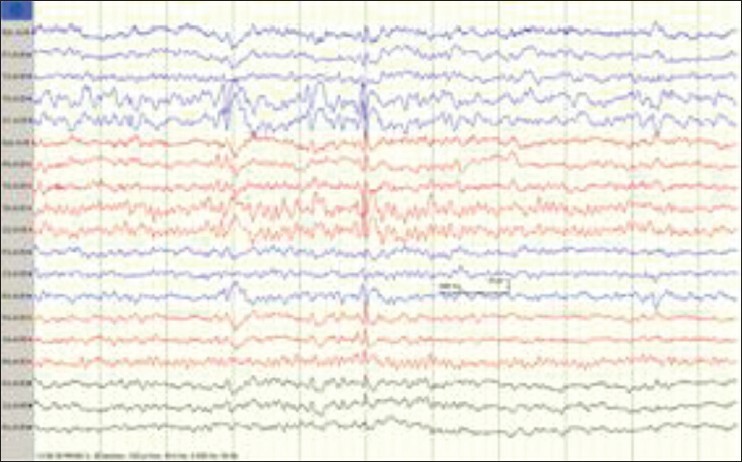 EEG then showed evidence for bilateral occipital spike and wave discharges, which led to further questioning and this revealed additional blurring of vision preceding the generalized seizures and also independent brief episodes with just blurring of vision, which actually started well before the generalized clinical seizures. A diagnosis of occipital seizures was made and drugs modified. CBZ was increased to 300 mg BD and CLN reduced to 1 mg OD (noc) and VAP to 500 mg OD (noc). 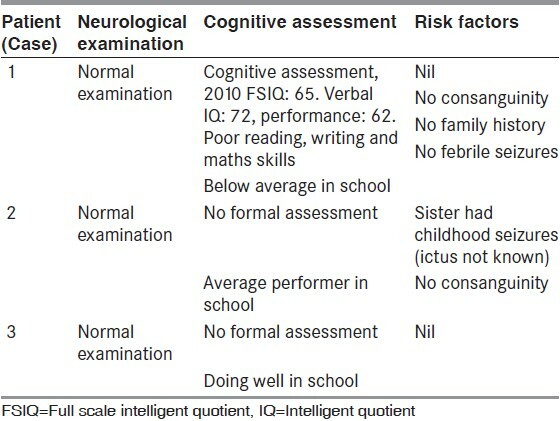 Imaging studies were normal [Table 3]. Seizures are better controlled now with reduction from weekly seizures to one seizure in the last 3 months. A 15-year-old boy suffered with two episodes of un-responsiveness lasting many hours once when he was 7 years and then when he was 9 years old. On both occasions, patient was travelling in a train with family. During these prolonged episodes, the boy suddenly went un-responsive and blue according to the mother. He also vomited during the first episode. There were no visual symptoms or jerking of limbs reported during both these events. This patient only underwent one routine EEG in 2005, which showed evidence for bilateral posterior spike and wave discharges. He responded well to CBZ [Table 1]. Despite stopping anticonvulsants 2 years ago he has remained seizure free. The previous 4 years on medication were also seizure free. An EEG performed in 2012 as follow-up was normal. The diagnosis of occipital seizures/PS was made retrospectively based on the previous history and EEG changes. Cases 1 and 2 represent the late onset benign occipital seizure syndrome (ICOE-G) and Case 3 is an example for PS. These cases also demonstrate how diagnosis can be tricky as visual symptoms may not be the presenting feature and is hard to elicit during history taking. ICOE-G, is a relatively rare form of occipital epilepsy accounting for about 2-7% of benign childhood focal seizures. ,,,,, Age of onset is from 3 to 15 years. Both sexes are equally affected. Visual symptoms include elementary visual hallucinations consisting of multi-colored circular patterns and ictal blindness. Deviation of the eyes, often associated with contralateral turning of the head, is the most common (in about 70% of cases) non-visual ictal symptom usually following visual symptoms. ,,, Eyelid fluttering that occur at a later stage could be a signal for an impending secondary generalization. Headache and sometimes postictal transient blindness is reported after prolonged seizure or status. Consciousness may be preserved initially during the visual symptoms, but is disturbed or lost in the course of the seizure. The differential diagnosis includes migraine with visual symptoms. In contrast, PS is more common of the two childhood-related benign occipital seizures types with susceptibility to autonomic seizures with little visual manifestations. ,, Ictal vomiting, eye deviation and autonomic features are the clues for this type of seizures. The maximum incidence is between 3 and 6 years affecting both sexes. Other autonomic features include pallor, cyanosis, incontinence of urine and feces, hypersalivation, coughing and abnormalities of intestinal motility. Breathing and cardiac irregularities are rarely reported. Syncope like manifestation occur in most occasions ,, with the child going "completely unresponsive and flaccid like a rag doll." Occasionally autonomic manifestations are followed by conventional seizure symptoms , such as unilateral deviation of the eyes, speech arrest, hemifacial convulsions, limb jerks or even automatism. Rarely, there can be secondary generalization too. These seizures are known to be prolonged lasting from few minutes to many hours, , occurring both during sleep and wakefulness. Many seizures have been witnessed while travelling in a car, train or aeroplane, just as our Case 3. Many reasons like disturbance of circadian rhythm, tiredness have been quoted, but there is no definite proof for this. The neuroanatomical and neurophysiological reasons for autonomic manifestations are not fully understood. As a rule of thumb, seizure onset is primarily with visual symptoms in ICOE-G and with autonomic manifestations in PS. In both seizure types, the EEG shows evidence for occipital spike and wave discharges or sharpened transients, , often demonstrating "fixation off sensitivity." Fixation off sensitivity is the phenomenon of activating epileptiform activity when fixation, which utilizes central vision, is lost (eyes closed). There is a corresponding termination of epileptiform activity when fixation is resumed (eyes opened). All three of the cases discussed here showed evidence for occipital epileptiform discharges. [Figure 1] and [Figure 2] show EEG changes for case one. It is also important to understand that interictal EEG findings in PS show great variability ,,,, being more multifocal (often posterior and centro-parietal). There are reports with ictal EEG changes for ICOE-G. ,,, Seizure onset is preceded by regression of occipital paroxysms and is characterized by the sudden appearance of an occipital discharge that consists of low amplitude fast rhythms, fast spikes or both. Elementary visual hallucinations relate to the initially fast spike activity and complex visual hallucinations may occur when the ictal discharge is slower. In oculoclonic seizures, spikes and spike-wave complexes are slower and a localized ictal fast spike rhythm may occur before deviation of the eyes. The ictal EEG findings of "Case 1" also showed evidence for similar EEG changes during telemetry work-up carried out for 24 h and we captured 10 events ranging from just visual hallucinations to tonic posturing with eye deviation and even one secondary generalized seizure. In the few reported ictal EEGs of PS, the discharges consist mainly of unilateral rhythmic slow activity, usually intermixed with fast rhythms and small spikes. They start in wider more often in posterior than anterior regions, quickly become diffuse and last for many minutes. ,, The first ictal clinical symptoms become apparent usually long after the onset of the electrical discharge. CBZ is effective in controlling the seizures. If there is evidence for additional photosensitivity, which is seen in some cases with gastuat syndrome, then VAP can also be used as first line therapy. The prognosis of ICOE-G is unclear, although available data indicate that remission occurs in 50-60% of patients within 2-4 years of onset. ,, It can also be more protracted and difficult to control as in Case 1. PS is remarkably benign in terms of its evolution, ,,, but autonomic seizures are of concern in the rare context of cardiorespiratory arrest. Remission often occurs within 1-2 years of onset. Although these seizures have a better prognosis in general, they still have a dramatic impact on parents. Anxiety and concerns are mainly related to the child's development. There is a need for supportive family management and reassurance if it is established that seizures are consistent with benign occipital seizure syndromes. 1. Engel J Jr. ILAE classification of epilepsy syndromes. Epilepsy Res 2006;70 Suppl 1:S5-10. 2. Gastaut H. A new type of epilepsy: Benign partial epilepsy of childhood with occipital spike-waves. Clin Electroencephalogr 1982;13:13-22. 3. Panayiotopoulos CP. Inhibitory effect of central vision on occipital lobe seizures. Neurology 1981;31:1330-3. 4. Panayiotopoulos CP. Early-onset benign childhood occipital seizure susceptibility syndrome: A syndrome to recognize. Epilepsia 1999;40:621-30. 5. Gastaut H, Zifkin BG. Benign epilepsy of childhood with occipital spike and wave complexes. In: Andermann F, Lugaresi E, editors. Migraine and Epilepsy. Boston: Butterworths; 1987. p. 47-81. 6. Gastaut H, Roger J, Bureau M. Benign epilepsy of childhood with occipital paroxysms. Up-date. In: Roger J, Bureau M, Dravet C, Dreifuss FE, Perret A, Wolf P, editors. Epileptic Syndromes in Infancy, Childhood and Adolescence, 2 nd ed. London: John Libbey and Company Ltd.; 1992. p. 201-17. 7. Caraballo RH, Cersósimo RO, Fejerman N. Childhood occipital epilepsy of Gastaut: A study of 33 patients. Epilepsia 2008;49:288-97. 8. Sadeh M, Goldhammer Y, Kuritsky A. Postictal blindness in adults. J Neurol Neurosurg Psychiatry 1983;46:566-9. 9. Panayiotopoulos CP. Vomiting as an ictal manifestation of epileptic seizures and syndromes. J Neurol Neurosurg Psychiatry 1988;51:1448-51. 10. Panayiotopoulos CP. Panayiotopoulos Syndrome: A Common and benign childhood epileptic syndrome, Vol. 1. London: John Libbey; 2002. 11. Ohtsu M, Oguni H, Hayashi K, Funatsuka M, Imai K, Osawa M. EEG in children with early-onset benign occipital seizure susceptibility syndrome: Panayiotopoulos syndrome. Epilepsia 2003;44:435-42. 12. Covanis A. Panayiotopoulos syndrome: A benign childhood autonomic epilepsy frequently imitating encephalitis, syncope, migraine, sleep disorder, or gastroenteritis. Pediatrics 2006;118:e1237-43. 13. Caraballo R, Cersósimo R, Fejerman N. Panayiotopoulos syndrome: A prospective study of 192 patients. Epilepsia 2007;48:1054-61. 14. Oguni H, Hayashi K, Imai K, Hirano Y, Mutoh A, Osawa M. Study on the early-onset variant of benign childhood epilepsy with occipital paroxysms otherwise described as early-onset benign occipital seizure susceptibility syndrome. Epilepsia 1999;40:1020-30. 15. Ferrie CD, Caraballo R, Covanis A, Demirbilek V, Dervent A, Fejerman N, et al. Autonomic status epilepticus in Panayiotopoulos syndrome and other childhood and adult epilepsies: A consensus view. Epilepsia 2007;48:1165-72. 16. Sanders S, Rowlinson S, Manidakis I, Ferrie CD, Koutroumanidis M. The contribution of the EEG technologists in the diagnosis of Panayiotopoulos syndrome (susceptibility to early onset benign childhood autonomic seizures). Seizure 2004;13:565-73. 17. De Romanis F, Buzzi MG, Cerbo R, Feliciani M, Assenza S, Agnoli A. Migraine and epilepsy with infantile onset and electroencephalographic findings of occipital spike-wave complexes. Headache 1991;31:378-83. 18. Thomas P, Arzimanoglou A, Aicardi J. Benign idiopathic occipital epilepsy: Report of a case of the late (Gastaut) type corrected. Epileptic Disord 2003;5:57-9. 19. Koutroumanidis M, Rowlinson S, Sanders S. Recurrent autonomic status epilepticus in Panayiotopoulos syndrome: Video/EEG studies. 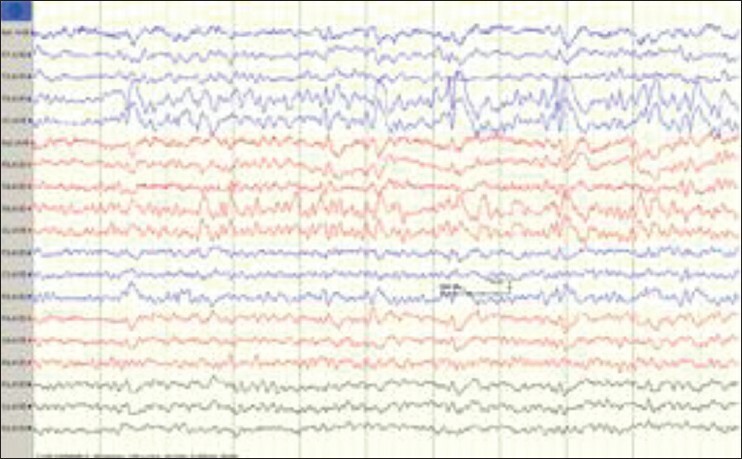 Epilepsy Behav 2005;7:543-7. 20. Parisi P, Ferri R, Pagani J, Cecili M, Montemitro E, Villa MP. Ictal video-polysomnography and EEG spectral analysis in a child with severe Panayiotopoulos syndrome. Epileptic Disord 2005;7:333-9. 21. Sturm JW, Newton MR, Chinvarun Y, Berlangieri SU, Berkovic SF. Ictal SPECT and interictal PET in the localization of occipital lobe epilepsy. Epilepsia 2000;41:463-6. 22. Valeta T. Parental attitude, reaction and education in benign childhood focal seizures. In: Panayiotopoulos CP, editor. The Epilepsies: seizures, Syndromes and Management. Oxford: Bladon Medical Publishing; 2005. p. 258-61.